Blogger is planning to upgrade it's look once again and it will be done by tomorrow (April 1, i hope it's not an April Fool). They have placed a visible notification on the dashboard and users can opt in to upgrade to the new look right away. Don't worry, you have an option to revert to the old look if you don't like it. While most people will think that changing look is a good progress and shows that Google still maintain Blogger, some users (including me) still likes the old and conventional look. It's pretty simple, minimalist, and the most important thing, it works. Until now, i still used the old template and not moving to the new one, because i might loose a couple of opportunities by upgrading to the new one. I have done the same steps when i still used the old editor because my Yahoo/Plurk Emoticon script still relies on the old editor and it's not compatible with the new one. Now i was forced to use the new one since Google has changed the old one so the script no longer works. In the new look of Blogger, you have an option to link your Blogger profile with your Google+ profile. This way, it's getting easier for you to post something on your Google+ page. The editor is also have been revamped and you can add more information about your post, such as adding your location. One feature i love most in the past is the preview button which instantly preview your post look like without having to open a new tab/window. It's been some time for me and my wife to watch movies at theaters and finally we had a chance today. We watched Wrath of The Titans, the sequel to the first one Clash of The Titans and i think this one is much way better than the first one. It has a mixed of romance, comedy, action, heroic, and of course, battle. I wish there will be the third sequel, but i kinda doubt that would happen. I'm not going to continue as it might give spoilers. Just watch the movie. It's worthed to watch it. I assure you. Microsoft has made another expected move by opensourcing their ASP.NET Web API and ASP.NET Web Pages under Apache 2.0 licence. It's their second attempt to open source some of the ASP.NET components after they did it with ASP.NET MVC some time ago. The code is now placed on their CodePlex repository. I believe that an open source project has better future rather than being locked within a company because people can contribute to the project freely and also security vulnerabilities can be identified (and fixed) quickly because more people are reviewing the project. If the crypto system works like this, why can't other projects follows what has been used within the crypto communities? GNOME 3.4 is now finally released to public. It's the second major release after GNOME 3 was introduced. The Release Notes will cover the changes that has been introduced on this release. Meanwhile, GTK 3.4 was also released few days before GNOME 3.4 is released. This is the first GTK+ release that works well on Windows. Windows support will be added soon. Several other related libraries were also released such as Cairo, GLib, and Clutter. LibreOffice has successfully replace OpenOffice.org only two years since it's being forked out of Oracle's OpenOffice.org. People liked to contribute to this project instead of going back to the original code of OpenOffice.org which is now handled to Apache project. Several people have a better idea of how to make improvements to LibreOffice by introducing collaborative editing features like what we already have in Google Docs. Basically it enables two or more people to work on a same documents together. It's very usefull features when you are entering an enterprise market since a document may be worked out by many people and it's so ineffective if you have to stop working on it to let other people edit your work. This new feature will not come in short, but it will be added as one of the idea for GSoC this year. Students who are interested on implementing this feature should contact LibreOffice developers to talk about this. It uses Telepathy, a flexible, modular communications framework that enables real-time communication via pluggable protocol backends. It has been used in many applications, such as Google Talk, MSN, Yahoo/AIM, IRC, and many other. Finally, Google is opening their branch office in Indonesia after their first visit to Indonesia few years ago by Eric (he was still Google's CEO at that time). They will open it on March 30, so it's just few days from today. Invitations has been sent to several important people and organizations and of course to the press media. They will also use this chance to introduce the Country Head Google Indonesia. Unfortunately, they haven't opened up their recruitment page. Until today, the recruitment page are still forwarded to their head office in Singapore. Are you interested to work in Google Indonesia? Apple has released iOS 5.1 and stopped signing for older version of iOS 5.0.1. That means that if you buy a new device (such as the new iPad) that comes with iOS 5.1 by default, you are left with tethered jailbreak unless you downgrade to iOS 5.0.1 which already have untethered version. Well, the good news is that it's possible for us to downgrade to iOS 5.0.1 even after you have upgraded to iOS 5.1. Unfortunately, there are still no public releases on tools used to perform the downgrade, so we need to wait for few days/weeks before a public release is coming out and users will be able to downgrade their A5-based devices. See FreakGeeks for more information about this news. I spent my whole day of eating with my family since my sister came with her husband and her son (my nephew). We travelled from one place to another place to enjoy culinary while she's at her hometown because she will be back to Jakarta next Tuesday. This week, my hometown is crowded due to long weekend because there is Nyepi that is celebrated as national holidays. Since usually people works for five days and the fifth day is holiday, they could have longer holidays and many people from other cities such as Jakarta, Solo, Bandung and many other came to Jogja and celebrate it with their relatives and colleagues. My sister also came from Jakarta with her son. It's nice to see him as he is so cute and adoring. He can finally met his great grand mother. It's really a nice and perfect timing for my family. Rovio has launched a new release of Angry Birds called Angry Birds Space. Unlike the previous regular updates of Angry Birds, it brings you a new way of playing Angry Birds because it introduces gravity as one of it's challenges to shoot the pigs while keeping the fun side as any other Angry Birds version. The International Airport of Ngurah Rai in Bali will be closed for 24 hours due to Nyepi and it will be re-opened again the next day. It's an annual event that took place on this Friday for this year. Approximately 290 flights were postponed due to this event, but since it has been announced earlier, most of the airways has prepared for this event and they have scheduled to have a non-flight to Bali on this date. Nyepi in Bali is very unique celebration, because other people (domestic/foreigners) will be participating as well because 98% of the local people in Bali will celebrate this by staying at their houses and doing self-reflection privately. Even tourists are not exempt; although free to do as they wish inside their hotels, no one is allowed onto the beaches or streets, and the only airport in Bali remains closed for the entire day. Only special vehicles are allowed to travel during Nyepi and that is taken for those with life-threatening conditions and women about to give birth. SPDY, an experimental protocol developed by Google is gaining popularity among other Open Source projects. After Mozilla implemented it in the Firefox, more projects are considering to include this protocol into their projects as well. The development tools for KDE project is now reaching a new milestone after they released KDevelop 4.3.0, a new major release after nine months of working. With this release, a new language support has been added and that's C++11, a new standard which was released last year. It's still preliminary support, so don't expect too much about it. Linus has finally released Linux Kernel 3.3 after having an extra RC last week and explain what he had in mind for his spring breaks with his kids in Oregon coast. It also means that the merge window for Linux Kernel 3.4 development is now open for the next two weeks (plus several days extra if Linus didn't have any Internet access there). Have a detailed description about this new features along with other changes in KernelNewbies. Manchester United stayed on top of the EPL table after crushing the home team Wolves with 5 goals. Three goals were obtained during the first half and two goals were in the second half. It was really a fantastic game by Manchester United and it's nice to see how they fight back after losing in European league few days ago from Bilbao. With this win, MU cut the goal difference gap with Manchester City and they are now four points away from City who will play their game in the next few days. It surely gives more pressures to Mancini's team as they have to win in order to stay behind United. PayPal is now working on a new product called PayPal Here. It's basically a credit card/debit card readers for modern smartphones (Android and iOS) that enables you to do transactions from your phone (micropayment). You can also use your PayPal balance to pay for the transactions. PayPal will charge 2.7% per transactions as flat fee. Unfortunately, Indonesia is not on their current plan list as they started with Hong Kong and Australia for their first target. They will be head-to-head with Square who already worked on this product earlier. With the future of E-Commerce lies in smart phones, future micropayment will be much much more simpler than ever and new services like this will become a global trend. Usually when a new iOS version is out, it takes quite a while before the hackers are able to perform untethered jailbreak on it, but a special case for iOS 5.1 do happened. i0n1c, one of the hacker had posted a tweet saying that he already had iOS 5.1 untethered jailbroken on his new iPad on the day of release. Later on, he uploaded a video on YouTube showing that he actually do have his new iPad untethered jailbroken. It's just a matter of time of when the exploits will be updated to reflect this finding. I guess it won't be that long in the future. I believe this might be a good news for those who wanted to buy the new iPad since they can expect to have the devices to be untethered jailbroken when they arrived later on. In the past, people had to wait for quite a long time before they can perform a fully untethered jailbreak on their devices, leaving them with tethered jailbreak for those who can't stand using the official version. So far, Firefox has been a wonderful browser and it's getting better when they introduced automatic update and also delta update. It significantly reduced the update size that has to be downloaded by the users. These conditions will get better in the future by the introduction of Silent Update that will be debutted on Firefox 12 and future enhancement will be introduced afterwards. If you are interested on what will be deployed within this year, please visit Firefox's plan for 2012. LibreOffice 3.5.1 is now available for public. After two RC releases, they are ready to mark it as a stable release. It's bit-by-bit similar to RC 2, so if you have used them, no need to re-download it again. As usual, this maintenance release doesn't bring any new features, just translation updates and also bug fixes. The list of changes can be seen on RC1 and RC2 pages. One of the bug fixes that people have expected is RTF import feature. It should now be resolved on this release. Those who have pre-ordered for The New iPad will glad to hear that Apple Online Store and Apple Retail Store will start selling it this Friday (March, 16) at 8 AM local time in US, Australia, Canada, France, Germany, Hong Kong, Japan, Singapore, Switzerland and the UK; along with Puerto Rico and the US Virgin Islands. They are ready to serve the hungry customers for their newest product unveilled few days ago. Again, Indonesia is not on their list and probably it will reach Indonesia officially at Q4 2012 or even worse, Q1 2013. If you are learning about Project Management, there's a bunch of online resources that might help you out, including Project Management on Google+. They posted a lot of useful links that can help you understand more about Project Managements. Project Management is really a unique discipline because it's not just theories, but should also be applied in real application and everything is based on unique conditions on where you apply the theory. Furthermore, PM is like a mixed of several discipline altogether, including economics, human resources, physchology, engineering, communications, and many others. iOS is now dominating the gadget area and the number of iDevices is increasing so fast so that their competitors are lagging behind Apple. Microsoft is one of them and today, they published what they are working on their Applied Science Group, which is the one millisecond lag devices. This should give better sensitivity over future products developed by Microsoft. If you are learning about Linux Kernel, then first thing you have to learn is the structure of Linux Kernel. It consists of a lot of layers and within one layer, there are a lot of subcomponents within. Sometimes you might get lost, but thanks to the Interactive Mapping of Linux Kernel, it has become easier for newbies such as me to learn more about Linux Kernel and find the related documentation about it. So help yourself by bookmarking this wonderful site if you are planning to learn more about Linux Kernel. Don't forget to use KernelNewbies as well as as one of the resources. It has a lot of good articles for starters. LinuxMint 12 LXDE is now available as it has been released by Clem last night. Just like the previous releases of LinuxMint 12, this version is also released as a hybrid images and utilizes DuckDuckGo as their default search engines. Linux Mint 12 LXDE is based on Ubuntu 11.10 and comes with LXDE 0.5.0 and the 3.0 version of the Linux kernel. Updated packages include Firefox and Thunderbird 7.0.1, version 2.33 of the Transmission BitTorrent client, VLC Media Player 1.1.12, AbiWord 2.8.6 and version 2.10.0 of the Pidgin IM client. Designing houses is very closely related to CAD families in the past, but that about to change in the future as more and more open source applications are available as an alternatives for the designers. One example is Sweet Home 3D. 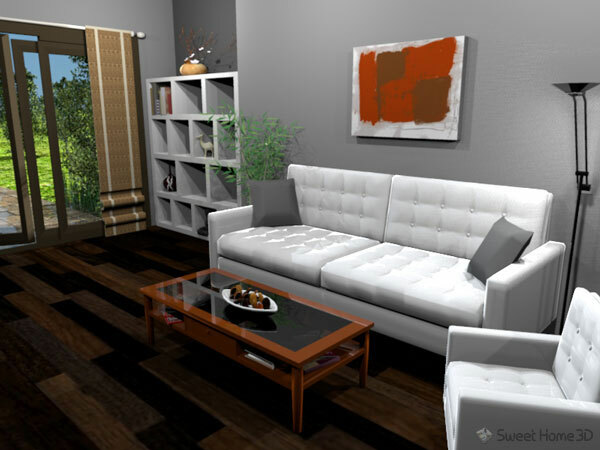 It's a free interior design application that helps you place your furniture on a house 2D plan, with a 3D preview. It's also nominated as one of the candidates for SourceForge's Project of The Month for this month. It's Java-based so it can run on many platforms, including Windows, Linux, Mac, and Solaris. Since it's built with MVC as the base, it's easy to extend using plugins. You can also import your own textures and 3D models. Could you really believe that these images are created using an open source application? Well, you have to because it's a real deal. Still unconvinced yet? Try the online demo (requires JRE installed and plugins are linked to your browser). You have seen the news. Apple is announcing their latest product as The New Ipad, not iPad 3 as most people would have guessed. It seems that Apple doesn't want to be easily guessed. They keep giving surprises to most of their fans, but unfortunately sometimes they didn't get their prizes. The new iPad will not use A6 chips, but A5X which is quad-core processors, it has 4G LTE support, Retina Display, 5 MP iSight camera, and brings iOS 5.1 as the default operating system. It has the same price as the old iPad 2 (which is now discounted $100 from it's original price). So what do you think of this new iPad? Does it interest you so that you pre-ordered this item? I do love it since i only have iPad 1 and it's clearly way slower and have less features than iPad 3, and i think i'm planning to buy it when it's available in Indonesia. This morning, i received an email from the instructor of Cryptography Class, Professor Dan Boneh telling that the Crytography Class has been officially available, even though the class will start next week on March, 12. Even though you've already signed up, you need to register and choose a password in the left side of the login box the first time you go to the site. The class will last for six weeks and officially starts on March 12. We will be covering two topics per week. Each topic will consist of a series of lectures with some embedded questions. There will be a weekly programming assignment plus a weekly problem set. The first week's assignments are posted and are due on March 26th. I encourage you to participate in our online discussion forums by asking and answering questions and discussing the material. We also welcome feedback on the course and the assignments. Please also forward this email to friends who might be interested in learning about cryptography or who might just be interested in this new form of online education. If you have friends taking the class, I strongly encourage you to form a study group to discuss the material. You might even find that it's more fun to watch the videos in a group. Welcome again and I hope that you find this class stimulating and thought provoking. It seems that they used Amazon's Web Service for the infrastructures so that it won't give them the burden to maintain the servers that might be overwhelmed with students, lecturers, researchers, scientists that joined the class. Do you know that Facebook has a Messenger for Windows? By using this application, you can chat with your friends just like with what you did with Yahoo Messenger or MSN Messenger or any other IM clients. Facebook also provides the Facebook Messenger for Mobile if you use your phone a lot. Right now, they are available only for Android, BlackBerry, and iPhone. Unfortunately, Symbian is not supported anymore, so i can't use it (even though Facebook has it's own version of Facebook for Symbian Mobile). It's March and it's time for a monthly KDE updates. Every month, KDE release a maintenance update that focuses on translations updates and also fixing bugs that exists on previous version of KDE. Several other open source projects also uses this cycle so that users have a scheduled time frame to update their application and hoping that the bugs they encountered will be fixed in the next release. In order to provide fair bandwidth usage to community and to the school that provides the bandwidth, i decided to make some changes into the server that i currently manage. I know some people will be annoyed by this change, but it's something i must do since the top priority of the server is to provide facilities for students. In the past, i didn't give any limit to the rsync connection. Some people abuse this service and use all of the bandwidth provided. So, right now, i reduced it to 10 connections max. When that number reached, you will have to wait. I have added the logging transfer options so that i can monitor what has been transfered to the public. The purpose of this repository is to help people to get packages easier and faster. If there's no one using it, i might shut down the repository and change to others that might be in high demand. I have removed Fedora on my repository list for some time, but i forgot to delete it from rsync list. Now, it's gone and the list has been sorted in ascending orders. I have changed the slackbuilds.org repository into slackbuilds so that it's simpler and shorter. For those who used this server to sync with SlackBuilds, please update your rsync script as soon as possible. MIT might be popular with it's OCW online course, but right now, there are a lot of online site that offer the same service (free education for public). This could help people who are unable to attend normal class session, but they have the spirit to learn more from the online tutorial or students who are looking for additional resources to learn something that they don't get in their courses. One of the site that i like is Khan Academy, a non-profit organization that has a goal of changing education for the better by providing a free world-class education to anyone anywhere. So far, they have more than 3000 videos and 311 practices and these number are increasing as time ticks. They divided into three big categories: Math, Science, and Humanities & Other. Below this main categories, lies more sub categories, such as Algebra, Computer Science, Physics, Biology, Chemistry, Finance, etc. BackTrack 5 R 2 has been released few days ago and they are now ready to be downloaded at UKDW ISO Server. So far, we have managed to download all of the installation ISOs (32 and 64 bit) and we are still progressing with the VMWare images. I also included all the checksum on the TXT file accompanying the ISO file on the same directory. Update (4 March 2012): All the VMWare images are already finished as well. Enjoy BackTrack 5 R 2. A new major release of PHP 5.4.0 has been released by the PHP team and it now replaces the PHP 5.3.0 as the old stable release. Some of the key new features include: traits, a shortened array syntax, a built-in webserver for testing purposes and more. PHP 5.4.0 significantly improves performance, memory footprint and fixes over 100 bugs. The official announcement is ready and so does the ChangeLog, but unfortunately, the migration guide is not yet completed as there are still some content missing or no information at all. Apple has just sent an invitation to the press media about their future events that will be held in March, 7. They use an interesting pictures showing a finger pointing at Calendar icon on iPad (3 i guess) that display the event date. Some speculations has came up after they see this invitation. Some people believe that the next iPad will remove the Home button and it will have a full touch screen interface on the surface. A lot of ideas that can be built on iPad 3 has sprung on YouTube, such as the one below. It's really a cool features if it's possible to be added or integrated inside iPad 3. I will definitely buy that device when it's officially sold in Indonesia.